Summary: Abrams and his new look crew seem ready to take chances with the franchise, and long may it continue. Star Trek’s rise in popularity is about to hit warp speed: J.J. Abrams has delivered an interstellar kickstart for the series which will win new fans as well as old. Yes, Star Trek might even be considered cool thanks to his youthful crew taking over the helm of the U.S.S Enterprise from the older generation who have dominated the films until now. Everyone knows Star Trek has never been a trendy franchise: Trekkies have always suffered from being singled out as geeks and the sci-fi television series has been a cult favourite guiltily enjoyed by a wider audience for short intervals. Uber-popular producer Abrams will change opinion as his reboot of the film side of the Star Trek franchise is a fresh take on what had become stale sci-fi adventuring with aging men. 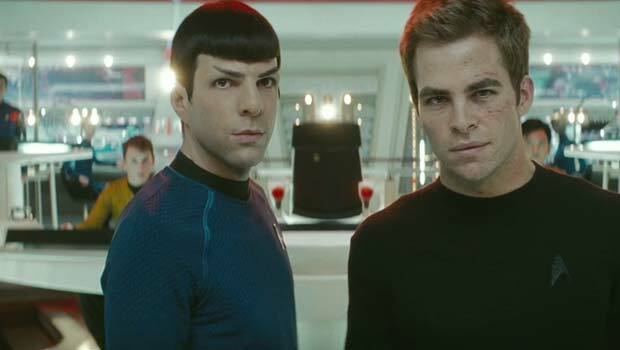 Star Trek is headed by two young and enthusiastic actors, here showing great potential as the iconic personalities of Captain James T. Kirk (Chris Pine) and Vulcan Spock (Zachary Quinto) in a story encapsulating their entry into Starfleet and subsequent first meeting when Kirk challenges Spock’s simulation using a cheat and seemingly creating an enemy. Of course, he doesn’t, but Abrams expertly plays out the cagey start to what will be come a lifelong friendship against numerous introductions as the Star Trek crew we know starts to take shape and an old face makes an appearance thanks to a time-travelling plot which links both this, and the franchise as a whole, together. As a television series expert, Abrams knows a thing or two about introducing characters quickly, efficiently and giving just enough drive to their desires in a few short lines to keep you interested. He uses this skill for Star Trek in what is essentially a big screen pilot for these fresh faces. Kirk, born seconds after his mother was evacuated from the starship his father captained, is a womanising drunk struggling to fulfil his potential until Captain Pike (Bruce Greenwood picking up the baton as the captain of the Enterprise in the original Star Trek series pilot which did not feature Kirk at all) encourages him to enlist with Starfleet. Meanwhile Spock goes against the advice of his elders by choosing to enlist in Starfleet too. Flashforward three years later and Spock is in a position of authority while Kirk only manages to join his Starfleet friend and doctor, Leonard ‘Bones’ McCoy (Urban), on the Enterprise thanks to a little bit of smart thinking. Once aboard you can see Abrams being to pull the various strings to fit the mythology of Star Trek fit together, but this is a vastly superior founding chapter than George Lucas achieved with his Star Wars prequels which injected no mystery into the mix. Here no single major special effect “moment” has been placed to slap you in the face with amazement while a plot is hastily scribbled down, Abrams sustains short but exciting action sequences with rich characterisation. Although Abrams largely wastes Eric Bana as rouge Romulan Captain Nero on the warpath for revenge against Starfleet, he acts as a lingering, if generic, menace and is central to a time-travel plot which sees a welcome cameo from Leonard Nimoy who gets to reprise the familiar Spock in a refined and dignified way only he is capable of doing. Looking on from the sidelines, Nimoy would have been impressed both by Pine and Quinto’s performances which grow together as the film goes on, and the performances of the other actors taking on famous roles. Urban gets McCoy’s eyebrow play and crankiness spot on while John Cho’s Sulu and Anton Yelchin’s Chekov remain a pair of oddities piloting the Enterprise and show potential as a second double act on the bridge. Pegg hams it up when he boards as Scottish engineer Scotty, breaking out all the classic lines such as “She can’t much more of this Captain”, though this is true throughout a script co-written by self-confessed Trekkie Roberto Orci – and all the better for it. Zoe Saldana provides depth to Urhura too, normally no more than a minor element on the Enterprise bridge, helped by a love interest with Spock – sure to bring mixed reactions from fans. Abrams brings Star Trek to life by breaking down it’s perception as being dull and doddery, putting a zest into the foundations and throwing plenty of action into the mix. You wouldn’t have seen William Shanter or Patrick Stewart doing the same adventuring Chris Pine does here. Abrams understands cinema audiences want to see their heroes taking the lead at the heart of the fight, and this he delivers. He still keeps within the boundaries of the Star Trek mythology by playing up the ensemble element of having a deck littered with personality: Star Trek remains a cosy sci-fi all about friendship and being respectful to each other – who am I to complain? It’s so encouraging to witness the fun injected back into Star Trek, something lost with the increasingly aging Captains Kirk and Picard mooching around spouting on about respect to alien races and erring on the side of caution. Abrams and his new look crew seem ready to take chances with the franchise, and long may it continue.